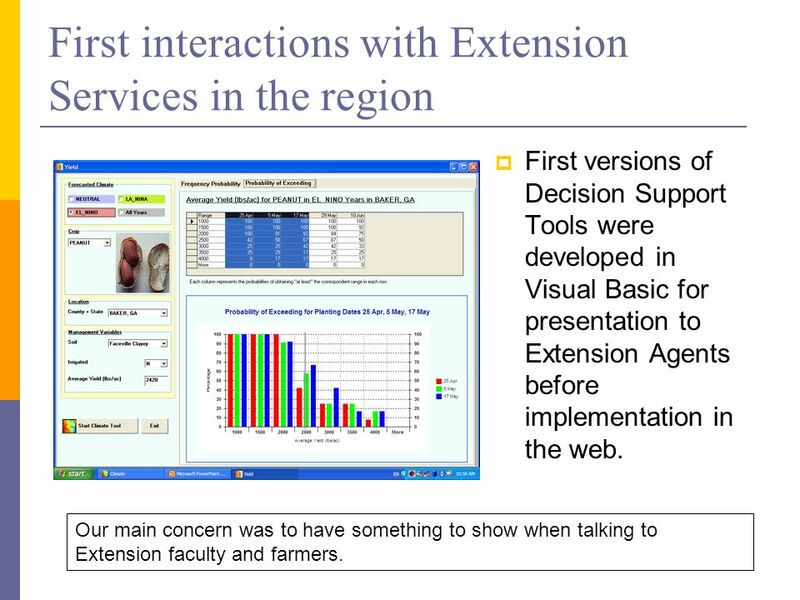 4 First interactions with Extension Services in the region First versions of Decision Support Tools were developed in Visual Basic for presentation to Extension Agents before implementation in the web. 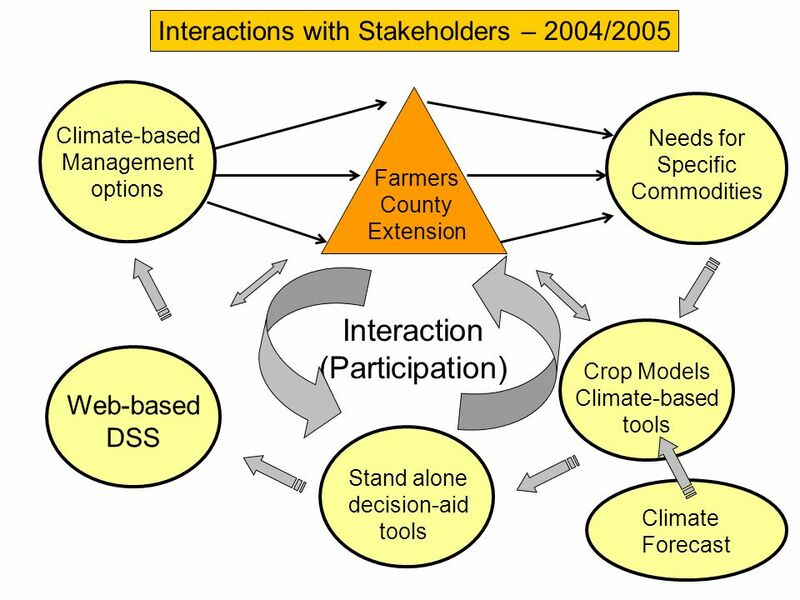 Our main concern was to have something to show when talking to Extension faculty and farmers. 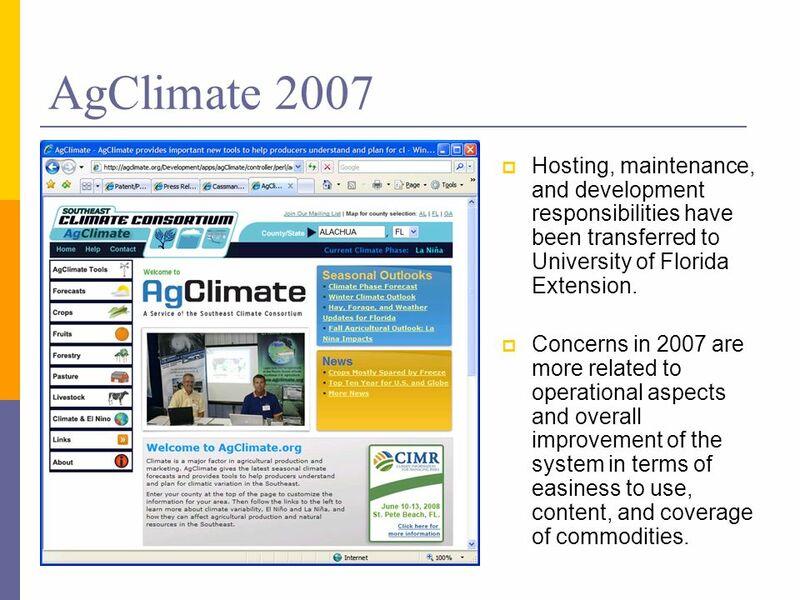 8 AgClimate 2007 Hosting, maintenance, and development responsibilities have been transferred to University of Florida Extension. 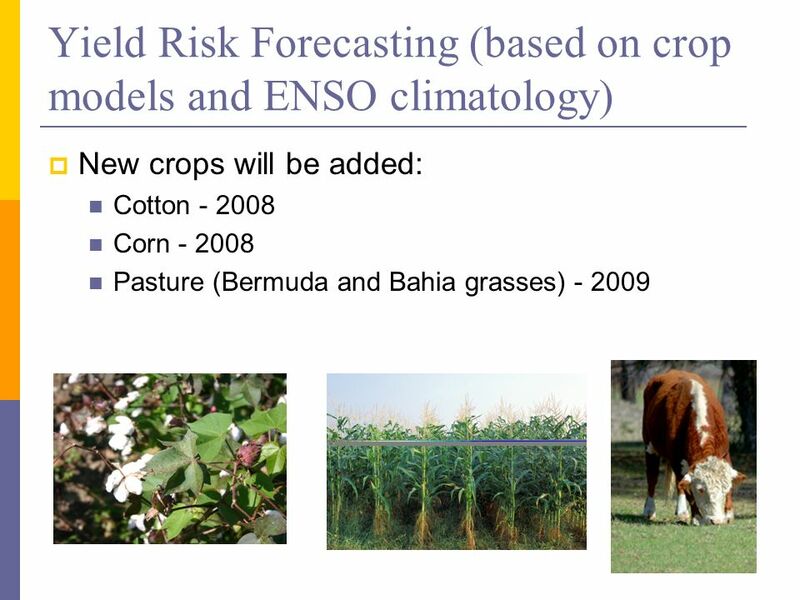 Concerns in 2007 are more related to operational aspects and overall improvement of the system in terms of easiness to use, content, and coverage of commodities. 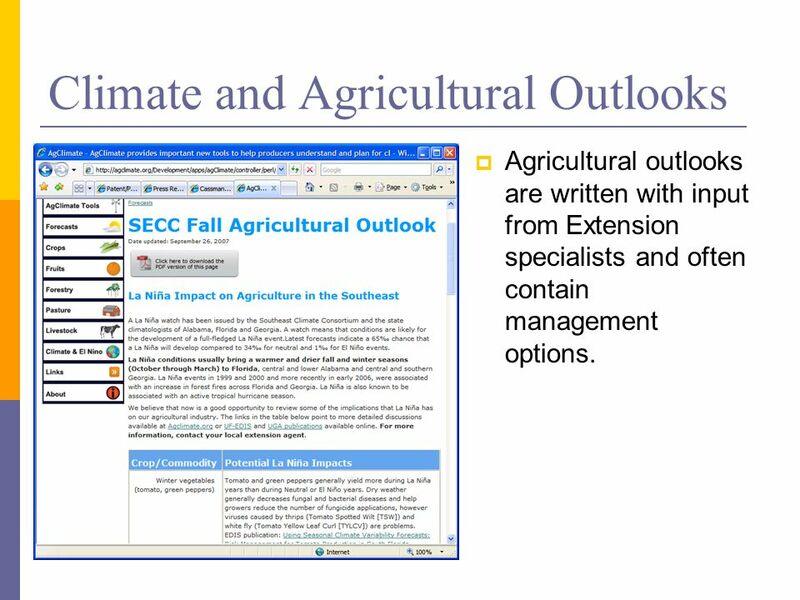 10 Climate and Agricultural Outlooks Agricultural outlooks are written with input from Extension specialists and often contain management options. 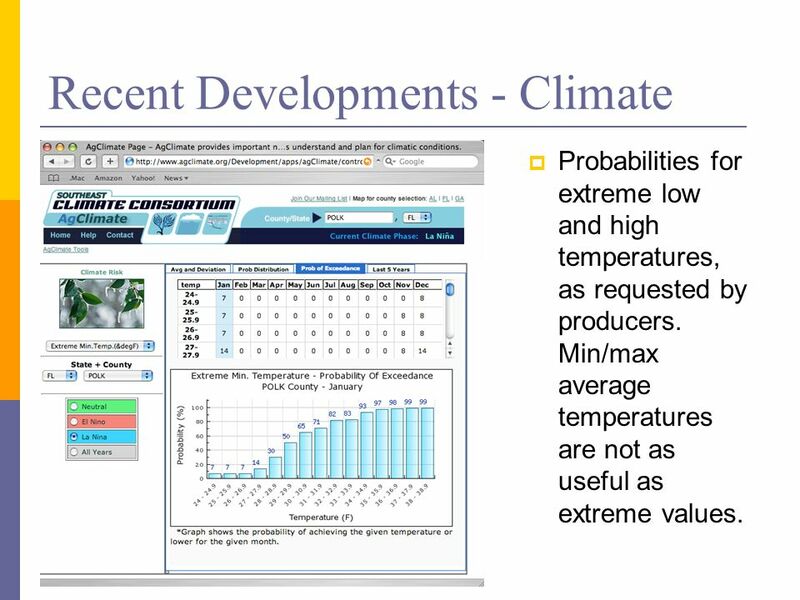 13 Recent Developments - Climate Probabilities for extreme low and high temperatures, as requested by producers. Min/max average temperatures are not as useful as extreme values. 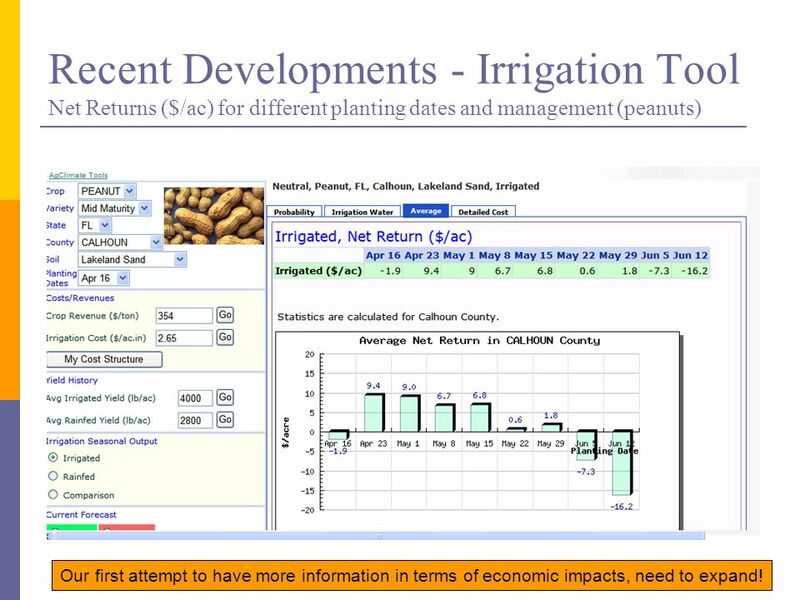 15 Recent Developments - Irrigation Tool Net Returns ($/ac) for different planting dates and management (peanuts) Our first attempt to have more information in terms of economic impacts, need to expand! 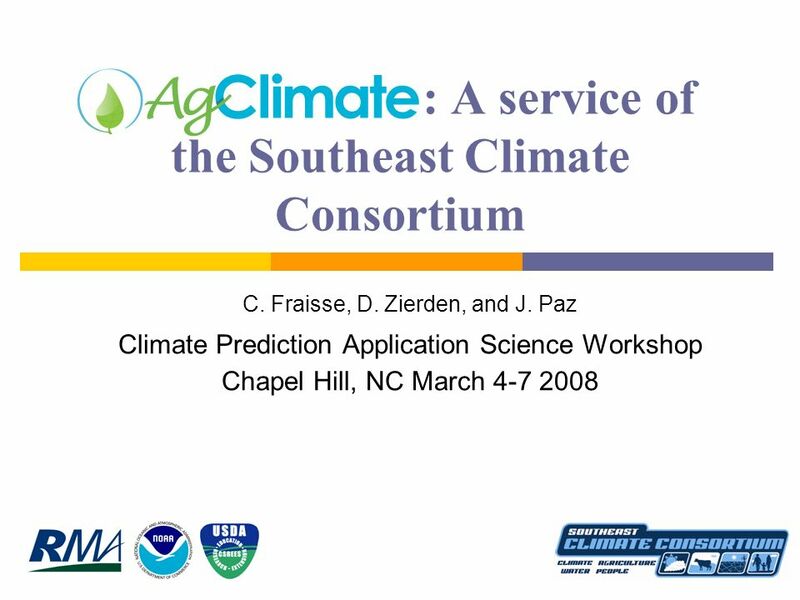 Download ppt ": A service of the Southeast Climate Consortium C. Fraisse, D. Zierden, and J. Paz Climate Prediction Application Science Workshop Chapel Hill, NC March." 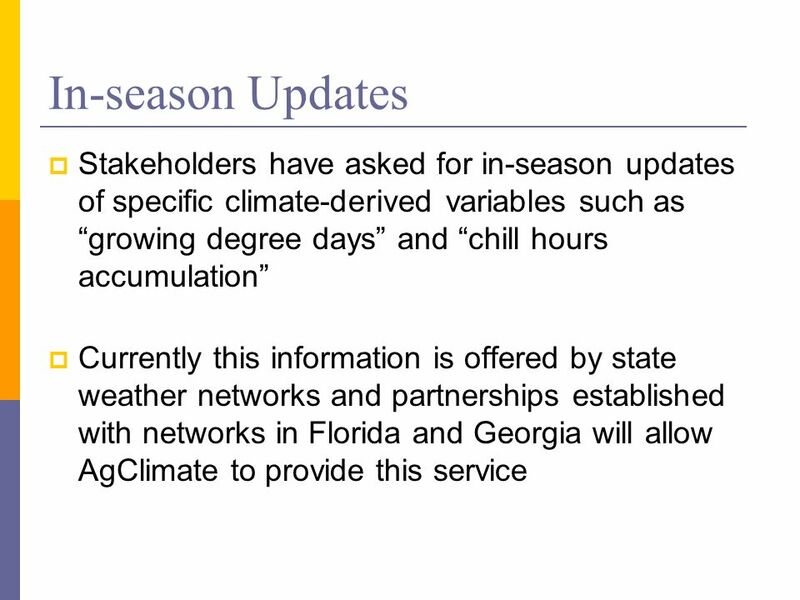 Climate Perspectives (CLIMPER): A New Tool for Assessing the State of the Climate Across the Southeast U.S. Charles E. Konrad Southeast Regional Climate. 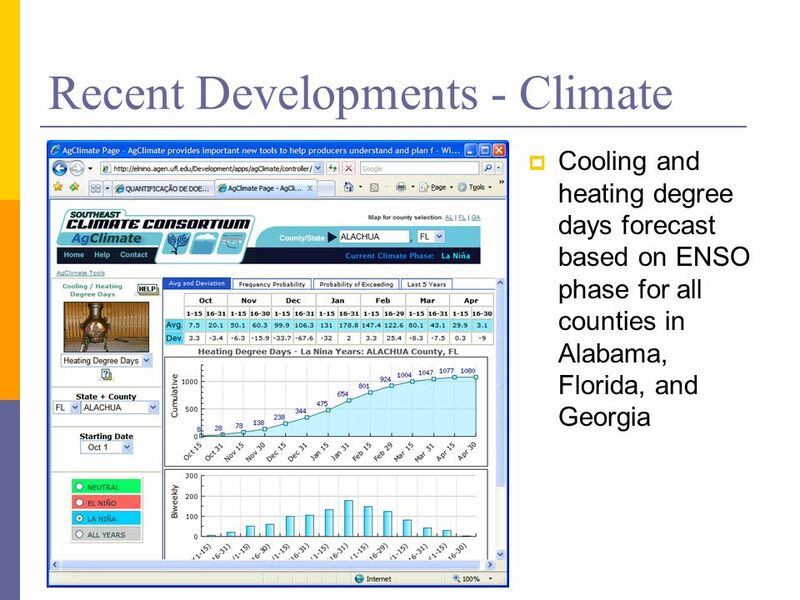 The Easter Freeze, 4-10 April 2007: An Assessment of Impacts and Services Ray Wolf and Doug Kluck NOAA/National Weather Service Climate Prediction Application. 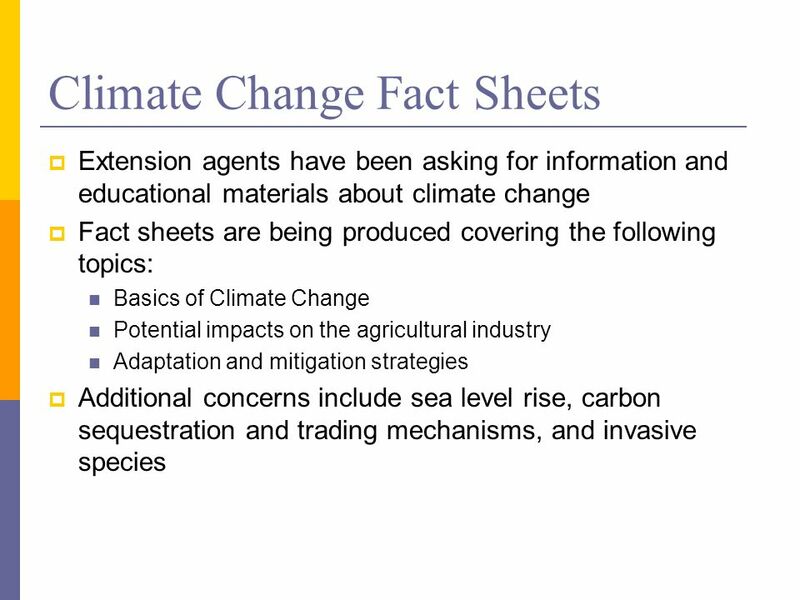 Impacts of climate anomalies on water resources in the Carolinas Dan Tufford, Greg Carbone, Jim Hussey, Kirstin Dow University of South Carolina Climate. 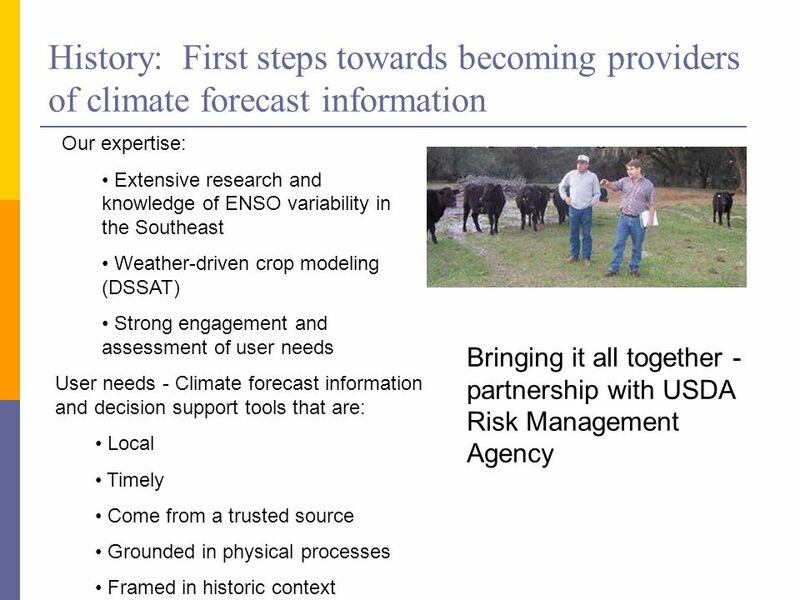 Understanding & Managing Agricultural Risk Caused by Climate Variability in the Southeast USA Keith T. Ingram. 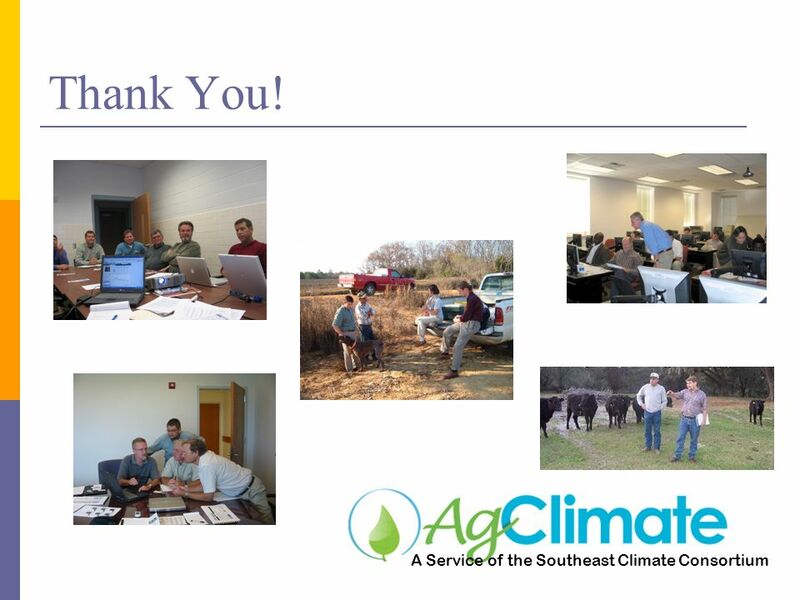 Southeast Climate Consortium Extension Program C. W. Fraisse, J. Bellow, N. Breuer, V. Cabrera, J. W. Jones, K. Ingram, and G. Hoogenboom. 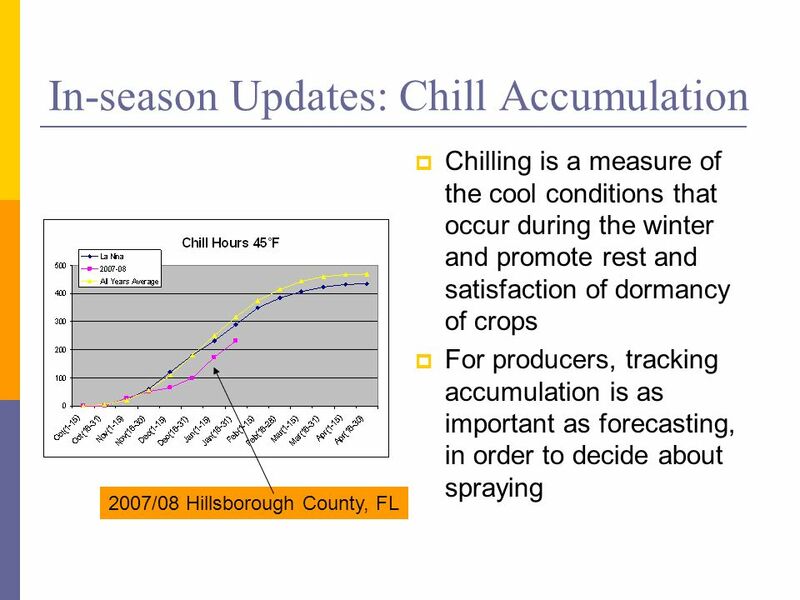 Forecasting Chilling Accumulation, Rest Completion, and Crop Development in the Southeastern U.S. John G. Bellow Agrometeorologist – Extension Specialist. 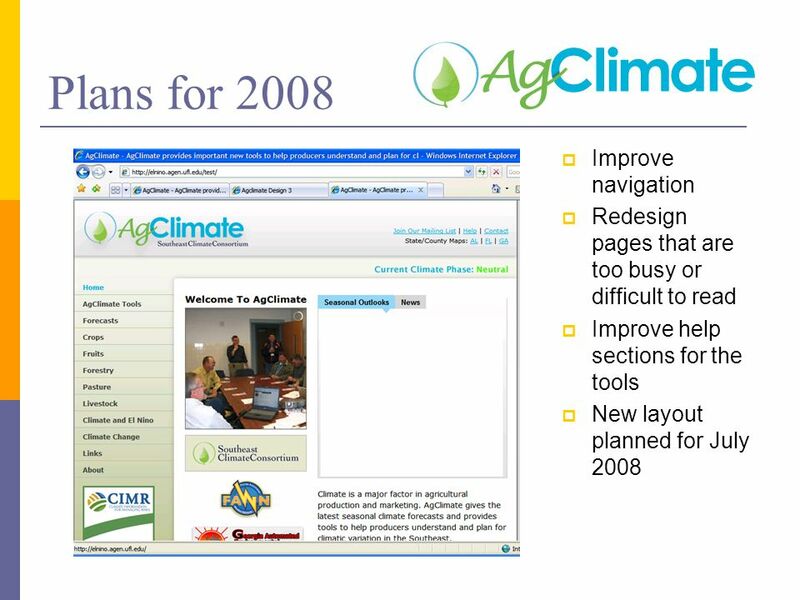 Click to edit Master title style Adaption Tools for a Developed Agricultural Economy Judy Lawrence Director, New Zealand Climate Change Office Ministry. 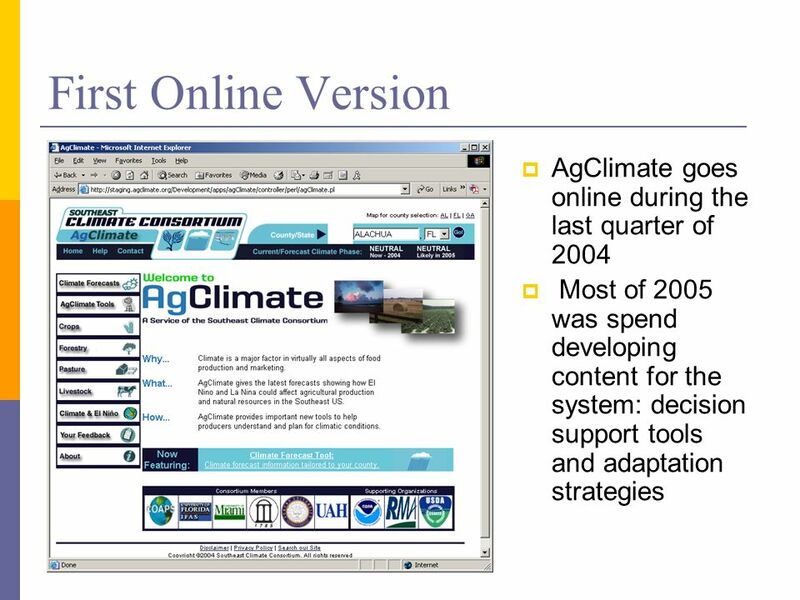 AgClimate Outlooks: Delivering climate-based information to stakeholders in agriculture Joel O. Paz, Clyde W. Fraisse, Norman E. Breuer, John G. Bellow. 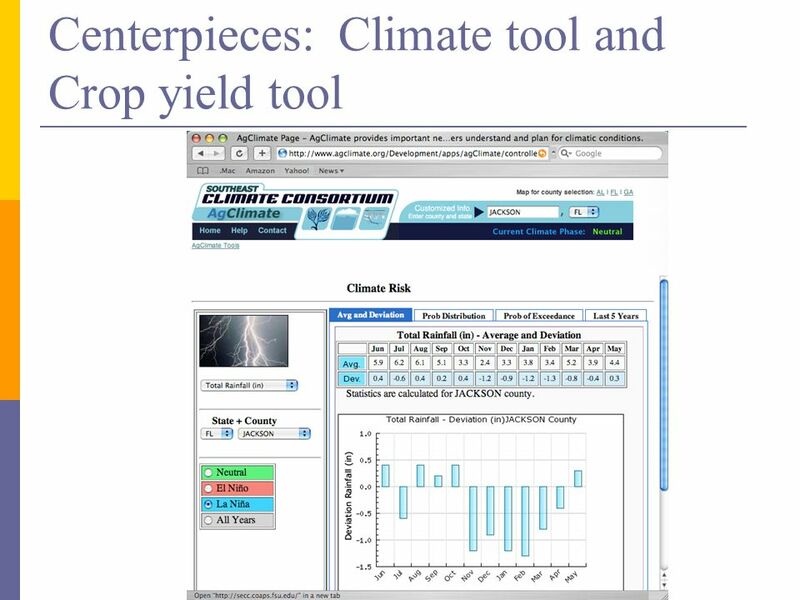 Climate Data and Crop Modeling Joel Paz, Gerrit Hoogenboom, Axel Garcia y Garcia, Larry Guerra, Clyde Fraisse and James W. Jones The University of Georgia. Climate Smart Agriculture East Africa Regional Knowledge Sharing Meeting Thomas Cole June 11, 2012, Addis Ababa, Ethiopia. 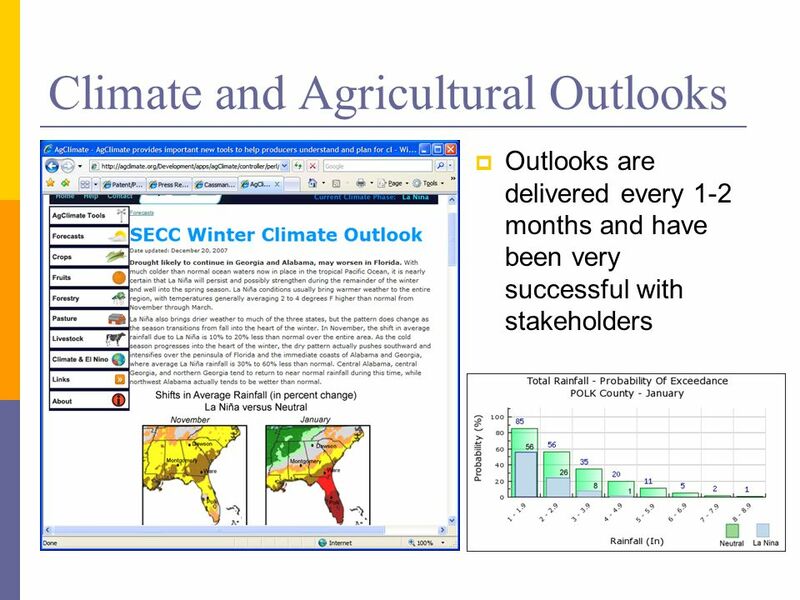 AG OUTLOOK LA NIÑA WINTER 2010 Clyde Fraisse Agricultural and Biological Engineering University of Florida November 18, 2010 Albany, GA. Operational Great Lakes Ice Charts and On-line Climatology 18 th Annual Canada/US Great Lakes Operational Meteorology Workshop Toronto Ontario Marie-France. 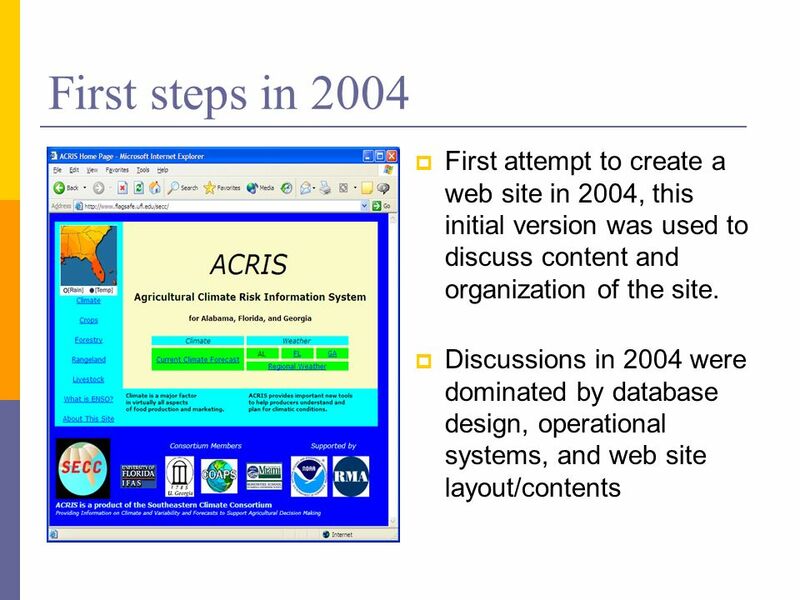 INTRODUCTORY PHYSICAL GEOGRAPHY. This is NOT a class about remembering the names, locations, or measures of physical features and natural phenomena around. 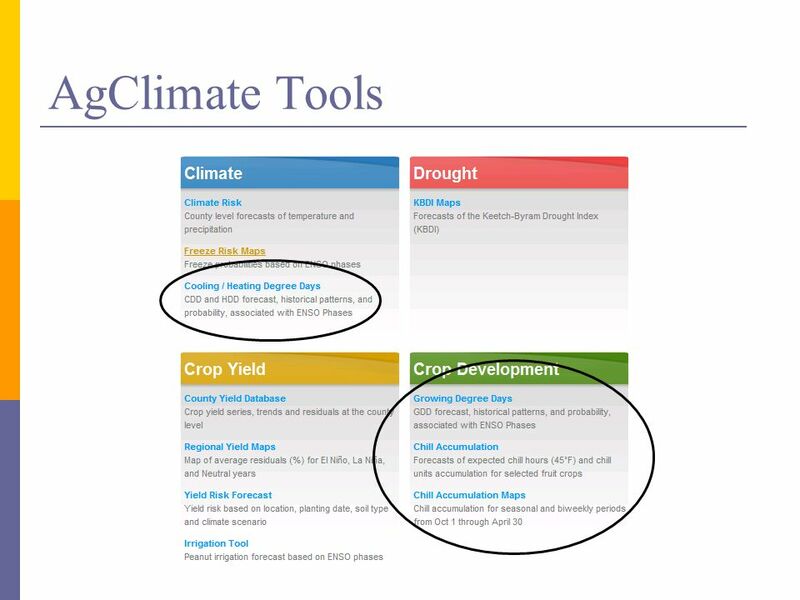 Climate Variability and Irrigation Water Use Joel O. Paz Extension Agrometeorologist Biological and Agricultural Engineering Department The University. 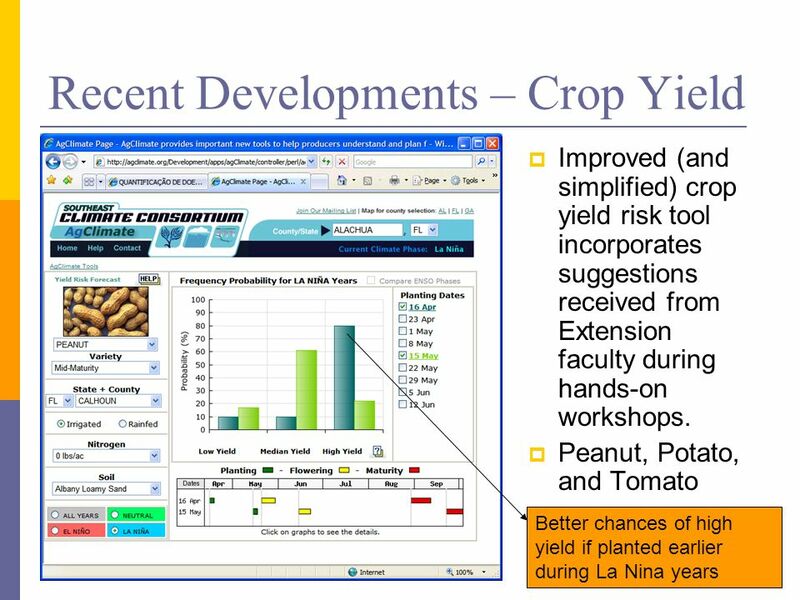 Nowlin Chair Crop Modeling Symposium November 10-11, 2000 Future Needs for Effective Model Applications James W. Jones  Users  Model Capabilities  Data.